In 1603, at the tender age of 18, a Roman nobleman named Federico Cesi founded the Lincean (or Lyncean) Academy. Cesi expected his followers — who all shared his home in the academy's earliest days — to be "slaves neither of Aristotle nor any other philosopher, but of noble and free intellect in regard to physical things." Together with three friends, Johannes Heckius (Eck), Francesco Stelluti and Anastasio de Filiis, Cesi chose the sharp-eyed lynx as a totem, and set the ambitious goal of seeing, understanding and classifying every last corner of nature. Needless to say, the Linceans failed to do this, but if they eager young men were arrogant or naive, their approach remains alive and well today as biologists continue trying to identify and classify living organisms. The Lincean Academy was, some have argued, the first scientific academy of the modern era. Though the group's members never numbered more than a few dozen in the early years, they produced important works in botany, zoology, geology, and astronomy — an entire research library. Linceans used the microscope to make beautifully detailed illustrations of plants and fungi roughly 40 years before Robert Hooke's famous Micrographia . Linceans reproduced 16th-century illustrations of New World flora and fauna for European scholars by publishing Francisco Hernandez's Thesaurus Mexicana — perhaps the academy's highest priority for the duration of Cesi's life, and a publishing project so complicated that no two copies came out quite the same. While some Lincean works were published during the 17th century, however, many more of their supporting notes and illustrations were eventually scattered among private collections throughout Europe. Manuscripts turned up in 1979 in the Bibliothèque de l'Institut de France; many illustrations wound up in the Royal Collection at Windsor. Fortunately, much of the group's work was preserved in a "paper museum" assembled by academy member Cassiano Dal Pozzo, and purchased by King George III in 1762. The paper museum had limited circulation, but it was studied by scholars throughout Europe in the 17th century. Early on, the young Linceans set about contacting Europe's best naturalists. They enjoyed an early boost, both in morale and prestige, through the admission of Giambattista Della Porta to their academy in 1610. In fact, Della Porta had started his own small academy in the 16th century, which also claimed the lynx as its mascot. The Inquisition shut down Della Porta's academy for several years, but that didn't prevent it from inspiring Cesi. Considered the greatest naturalist of his age, Della Porta was also an accomplished playwright, and his erudite comedies dominated the Italian stage for years. At the height of his fame, it was said that the two leading tourist attractions in Naples were the Baths of Pozzuoli and Giambattista Della Porta. Della Porta was a product of old, rather than new, science. He retained the Renaissance reverence for the works of classical authorities. He supported the ideas of antipathies and sympathies, and the doctrine of signatures (the belief, for example, than an herb resembling a scorpion is the perfect remedy for a scorpion sting). He discussed in detail the difference between "evil" magic and "natural" magic, and his works fell into the category of "books of secrets" common in the 16th and 17th centuries. His (not very reliable) notion that one's character could be determined from facial features — known as physiognomy — persisted for centuries, as did his human-animal facial comparisons. By the time of Della Porta's death in 1615, Cesi had lost much of his admiration for the elderly savant. By then Della Porta had been eclipsed by a new academy member. The astronomer Galileo became the sixth member of the Lincean Academy in 1611, and afterwards proudly displayed the lynx logo on his publications. In return, the academy stood by Galileo after his patrons, Maffeo Barberini (Pope Urban VIII) and the pope's nephew Cardinal Francesco Barberini, deserted him. Galileo's entrance into the academy wasn't uniformly welcomed by the existing Linceans. Della Porta dismissed Galileo's telescope (something Galileo himself never claimed to have actually invented) claiming that he, Della Porta, had more or less invented the same thing years earlier. Galileo's allies-turned-enemies, the Barberinis did support the Lincean Academy from time to time (Francesco Barberini himself was a Lincean), and this caused an odd paradox. Though the academy wanted to accurately depict nature, it also had to sufficiently flatter its patrons. Sometimes, this worked reasonably well. 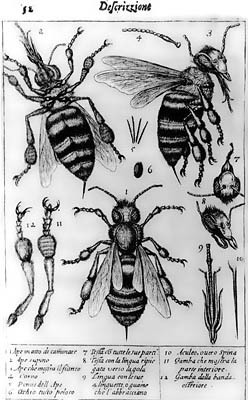 Producing flowery treatises on the trademark Barberini bees — using the "little eyeglass" Galileo invented around 1620 — induced the Linceans to draw exquisite bee illustrations in microscopic detail. The examinations might have afforded the savants the opportunity to discover the insects' naughty parts, but Cesi instead maintained that the head of the hive was, like the pope, male and chaste. In a more blatant instance of patron pleasing, Lincean Johannes Faber found himself reluctantly describing Dracunculus Barberinus, a probable forgery but something he had to take seriously because it belonged to Francesco. This utter dependence on aristocratic patronage was typical of the time. German Jesuit polymath and dragon enthusiast Athanasius Kircher depicted probably the exact same specimen in his book Mundus Subterraneus later in the 17th century. In 2014, Phil Senter and Darius Klein concluded that Barberini's so-called dragon "includes the skull of a weasel (Mustela nivalis), the belly skin of a snake, the dorsal and lateral skin of a lizard, and the tail skeleton of an eel (Anguilla anguilla)." The Linceans carried out some of the Western world's first serious research in paleobotany, concentrating on fossil wood found near Acquasparta. The Linceans were divided on the issue of fossil origins, but examination of the fossil wood deposits caused Stelluti, who carried on with Cesi's research after his death, to conclude that fossil wood had formed inside the Earth. Considering the varying preservation states of the fossils examined, and the fact that much of the wood was transported away from its original locality without any fossil leaves, the Linceans' mistake was understandable. While describing the illustrations as "some of the most beautiful and creatively designed images of fossils ever done, including careful attention to the topography of the Umbrian landscape from which they emerged," science historian Paule Findlen describes the fossil-wood study as a "visual success but an interpretive failure." Through Dal Pozzo, some of the fossil wood eventually made its way to the Royal Society of London and Robert Hooke who, after soaking and drying, or heating some specimens, concluded they were ancient wood. Regardless of their conclusions about fossil wood, the Linceans produced field illustrations of unprecedented quality. This was also true of fungi depictions, considered by the savants to be "imperfect plants" because they lacked discernible flowers, fruits, or seeds, and because no one could figure out how they reproduced. Though illustrations comprised some of the Linceans' most important contributions to science, Cesi eventually realized that illustrations alone wouldn't suffice. Too many different organisms showed superficial resemblances. The Linceans turned to dissection to better understand their subjects, and Cesi himself began working on "phytosophical" tables to classify nature in 1616. He continued working on these tables even on his deathbed. The Tabulae Phytosophicae, as Cesi called his classification tables, attempted to order all of nature by dividing subjects into ever more specific categories. Some science historians have credited Cesi with producing the earliest description of biodiversity, a concept he termed diversitas. Though his classification scheme aimed at everything in the world — hardly a realistic goal — Cesi made real progress classifying plants, and his expertise with this subject was very hands on. His signature on numerous plant illustrations indicates that he examined and drew them himself, with the aid of Galileo's microscope. 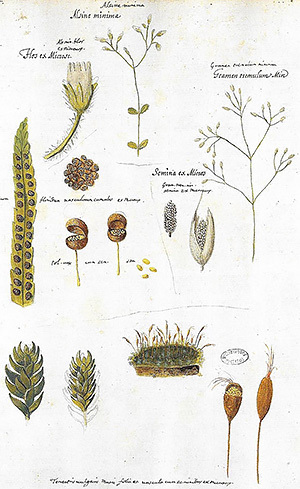 Decades before Hooke and Leeuwenhoek, Cesi would have been among the first naturalists to look at plant and fungi features in microscopic detail. And even before he viewed them under a microscope, Cesi theorized about the function of fern spores. And long before Linnaeus pioneered binomial nomenclature, Cesi introduced the concept of family (as in kingdom, phylum, class, order, family, genus and species), and he and his friends were assigning double names, part general and part specific, to plants they collected. Cesi was nevertheless a product of his time, and superstition crept into his work, including the assertions that wheat could transmogrify into ryegrass, plants could germinate from putrescence, and plants would be more productive in leap years. Although born to privilege, Cesi never enjoyed an easy life. His hedonistic, anti-intellectual father had fellow Linceans Heckius and Stelluti expelled from Rome. In Heckius's case, Cesi's father made the ironic accusation that the ardently Catholic young naturalist was a Protestant. The only one of the founding Linceans educated at a university, Heckius traveled widely in the months that followed, making useful connections but, never possessing a stable temperament, he eventually lost his mind, and was even expelled from the academy he loved. Cesi moved to Naples to put some distance between himself and his dad, and after his father disinherited him, Pope Paul V named the young man Prince of Sant'Angelo and San Polo. This improved Cesi's social position, but did little to help his ailing family. Six of his children died in infancy, and Cesi himself died in 1630, unable to finish the work he loved, or see Galileo through his trial by the Roman Inquisition. Cesi's untimely death more or less doomed the academy to an early demise as well. How much the Linceans actually would have accomplished had Cesi lived longer is hard to tell. Ancient philosophy still influenced Lincean works throughout the 17th century, and fear counterbalanced any desire to understand nature. Before publishing any book, scholars had to seek imprimatur from a paranoid papacy, so research whose implications might contradict Scripture had to be described carefully, if not avoided altogether. Yet Cesi was the ultimate diplomat and, while alive, he succeeded in keeping papal suspicions at bay. Financial support for the Linceans disappeared after Cesi's death, and the academy virtually disappeared before the end of the 17th century; Kircher saw his own museum in Rome as a replacement for Cesi's studio. The Linceans enjoyed several comebacks, however, including strong support in the 19th century from — ironically — the conservative Pope Pius IX, who renamed it the Pontifical Academy of the New Lincei. During that time, the academy admitted a relatively rare phenomenon: a female botanist, Countess Elisabetta Fiorini. But the Linceans lost many members in the unification of Italy in 1870, and in the 1930s, almost all of the Linceans succumbed to political pressure and declared allegiance to Italy's fascist regime. (In 1944, the academy reformed without its fascist appointments.) The Linceans survived into the 21st century, but with little governmental funding. With a membership cap of 150 "full" members, scientists could wait decades for full membership. As of 2003, the average membership age was 76.